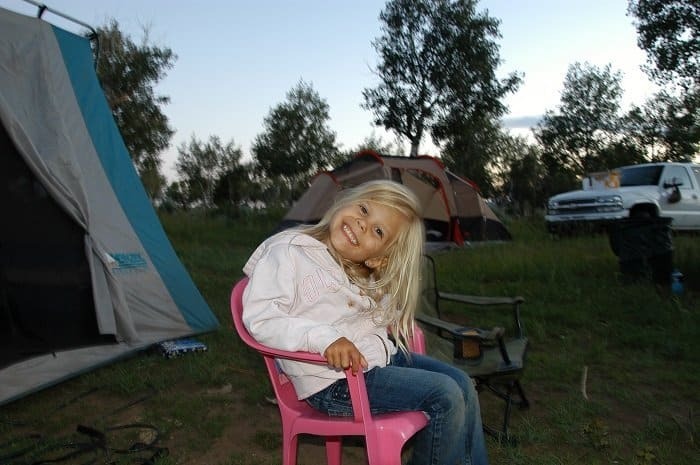 Camping is the perfect vacation with your family. It is sure to promote family fun, adventure, relaxation, nature’s beauty, and a time to unplug from the world. Set up your tent, unroll your sleeping bags, and kick back in your favorite camping chair. Sitting around the campfire at night roasting marshmallows with your kids is the best entertainment in the world. Camping provides a rare chance for them to just be a kid, using their imaginations with sticks and dirt and getting away from technology. These are simple times to recharge and have a ton of fun. Whether you’re a first-time camper or a seasoned ranger, these five campsites are sure to offer a great time for the family. Wasatch Mountain State Park is in the beautiful Heber Valley. It is both a summer and winter destination. Soldier Hollow, the 2002 Olympic winter venue, is located at the park’s south end and is open year-round for summer and winter activities, including biathlon, cross-country skiing, tubing, mountain biking, and hiking. 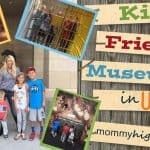 The site is perfect for kids and families. Of course, it has bathrooms, showers, and picnic tables. They have a concessions area and great bathrooms that are really nice and clean. It has easy hiking trails and creeks. 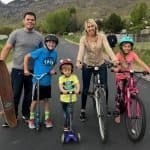 It is close to Park City Outlet mall, so you can even sneak out to spend the day shopping or get out with the kids for dinner to make it easy. Grab your fishing poles and head out for a great adventure! This is a great one for kids. 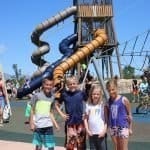 It’s close to Park City so it’s easy to go into town for food, fun, and shopping or any emergency. There are great bathrooms, and it’s the perfect campsite for a boating trip. Even if you’re not boating, it has a great beach area with nice shade trees, which are the perfect combination for kids. Deer Creek State Park is super easy to get to. 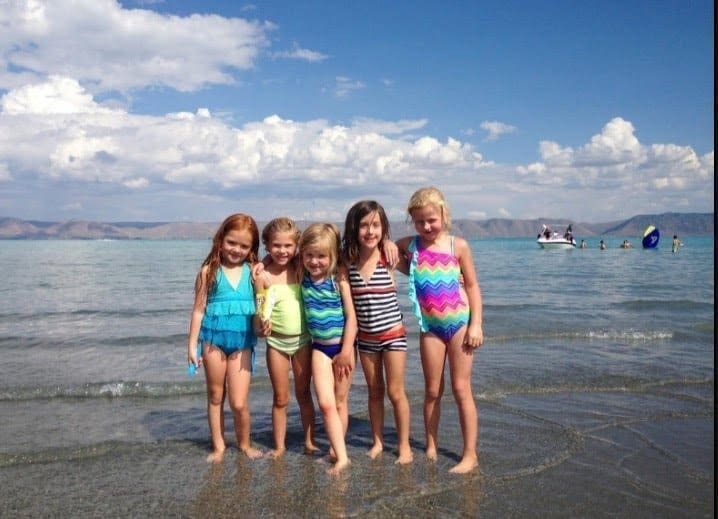 The trip takes about 30 minutes from Provo and an hour from Salt Lake City. It’s located in Heber Valley at the base of Mount Timpanogos. The lake is extremely popular for water sports and camping. Our family’s favorite activities are mostly water-based: we love boating, water skiing, sailing, windsurfing, swimming, and fishing. You can even fish year round! Deer Creek Island Resort at Deer Creek State Park provides many services like boat rentals, wakeboard clinics, a restaurant, store, and catering services. And don’t forget to take your sand toys, life jackets, and swim floaties! 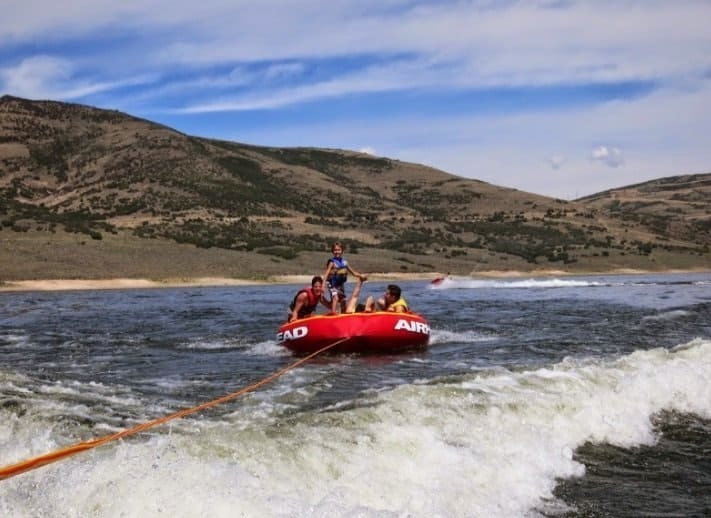 Strawberry Bay Campground is located on the shore of the beautiful Strawberry Reservoir at an elevation of 7,200 feet. Visitors love to go to Strawberry for its great boat fishing and hiking trail opportunities. Strawberry Marina is within 1/4 mile and offers a boat ramp, power and pontoon boat rentals, slip rentals, fuel, and a small general store with fishing supplies. 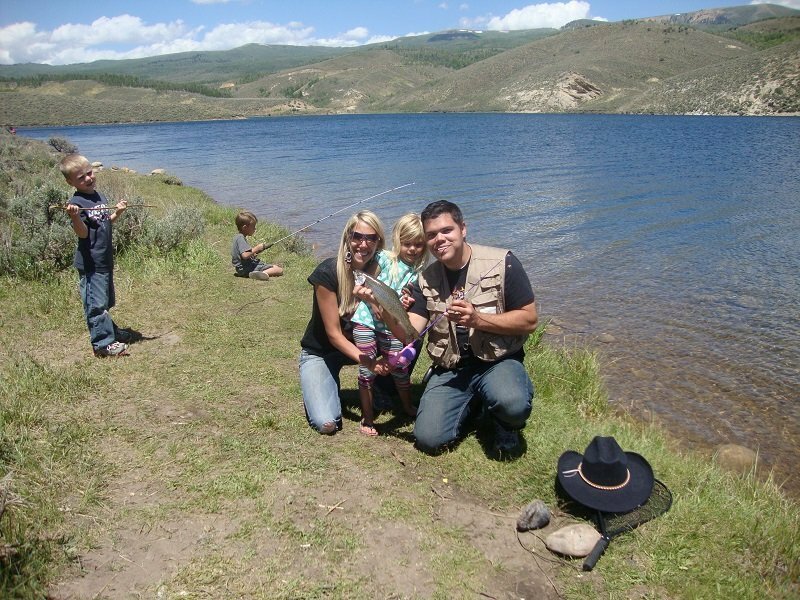 Strawberry Reservoir is Utah’s premier trout fishery. If you want to catch big trout and lots of them, be sure and make Strawberry your fishing destination. The best part? Many of the areas are kid-friendly. It has flush toilets and covered picnic tables at the boat launch area. That area provides hours of fun for catching crawfish if you’re brave. My son loves to catch them. Granite Flat Campground is located not too far up American Fork Canyon. It’s less than a mile from Tibble Fork Reservoir. You’ll love the beautiful drive getting there. There are so many great activities to do such as fishing, canoeing, and tons of hiking for all different hiking levels from experienced hikers to the beginner. It has bathrooms, hot showers, and picnic tables. Kid-friendly activities include baseball fields, canoeing, and a horseshoe pit. For the ultimate adventure, you could even hike and/or tour the Timpanogos Cave. The Timpanogos Caves are a National Monument located a few miles down American Fork Canyon. They give 55 minute guided tours where you can see all three different rooms that are in the caves. It’s truly a spectacular sight to see. The trail leading up to the cave entrance overlooks beautiful views of American Fork Canyon. The hike to the cave is fully paved and is 1.5 miles. It’s kid and stroller friendly, but it’s a little steep so you may want to go slow and take your time. Prices for the tour are $8 for adults, $6 for kids 6-15 years old, and kids ages 3-5 are $4. Kids 2 and under are free. Bear Lake is on the Utah-Idaho border. It’s called the “Caribbean of the Rockies” because the water is turquoise blue and you feel like you’re in the Caribbean. Super cool. I call it the Hawaii of Utah. It’s absolutely beautiful with the emerald blue water, and it’s very kid friendly due to the shallow water. While you’re there be sure to go into Garden City and get a yummy raspberry shake. Bear Lake is known for their Raspberries. Also, go eat at LaBeau’s Drive in. It’s like a fun little resort town with the best vacation beachy vibe. Bear Lake State Park – Rendezvous Beach is located on the south shore near Laketown on Utah State Road 30. There are tons of campsites that all share Rendezvous Beach. When you camp here you get to use the large beach area and you can reserve a pavilion for the day if you are with a large group. All the campsites have bathrooms and showers which are a great plus after playing in the sand all day. They offer boat and Sea-Doo rentals, plus you can rent other fun water toys, boating and fishing supplies, and other accessories. There’s a small fast food grill that has THE BEST corn dogs as well as shopping for anything you might need from buckets, rafts, sun block, bathing suits, and more. The campsites have large shade trees, which is perfect for everyone to stay cool. This is an amazing campsite! How fun is it to spend the day at the best beach and then have a campfire at and roast s’mores at night. Some people might think camping with kids is stressful, but it doesn’t have to be. All of these are kid-friendly and all equipped with hot showers, flushable toilets, and picnic tables. 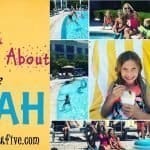 They all have fun activities for kids, and you are sure to be as busy or as relaxed as you want to be. Unwind and unplug and get out it in the great outdoors. Hear the crunching sound of the aspen trees in the wind and the crackling fire at night. It won’t cost you a fortune, and your kids will remember these times forever. 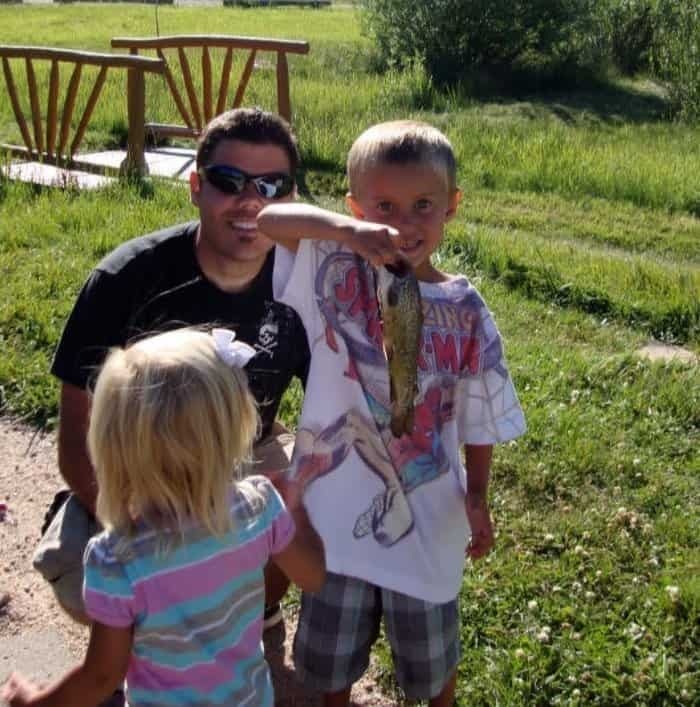 Those are priceless memories you will share with your family while camping. Enjoy and here’s to having Happy Campers!